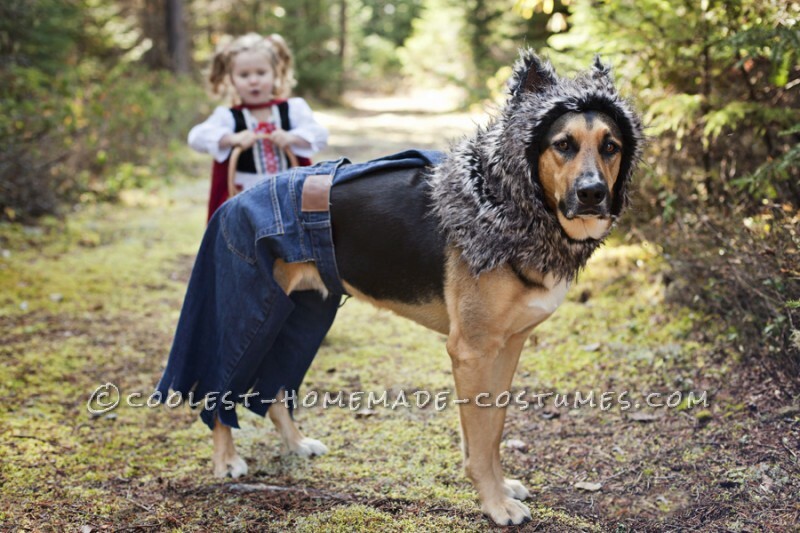 Every year I like to come up with costumes that tell a story for my daughter Emma and my dog Riley. This year I decided they would be Little red riding hood and the big bad wolf..(or what my daughter would say…little bad wolf cause big bad wolf is scary). I had Emma’s costume already so I had to figure out how to make Riley’s costume. 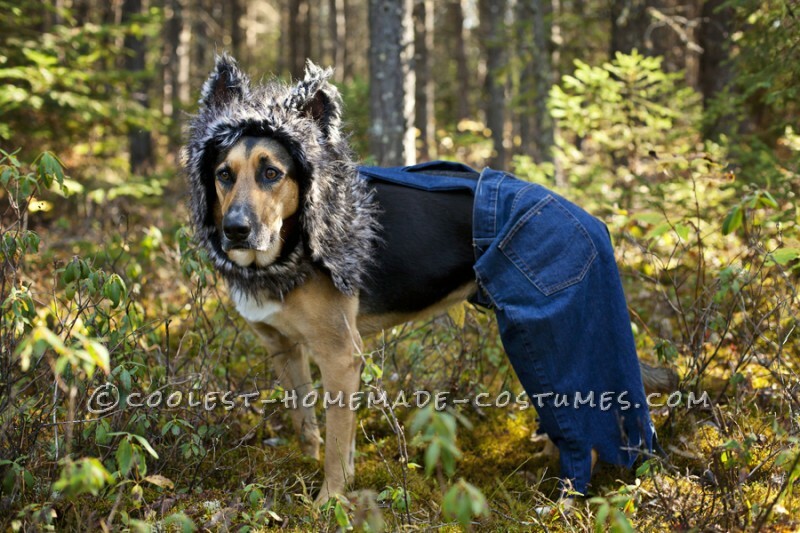 I searched the internet on how to make a hood and how to sew fur together. 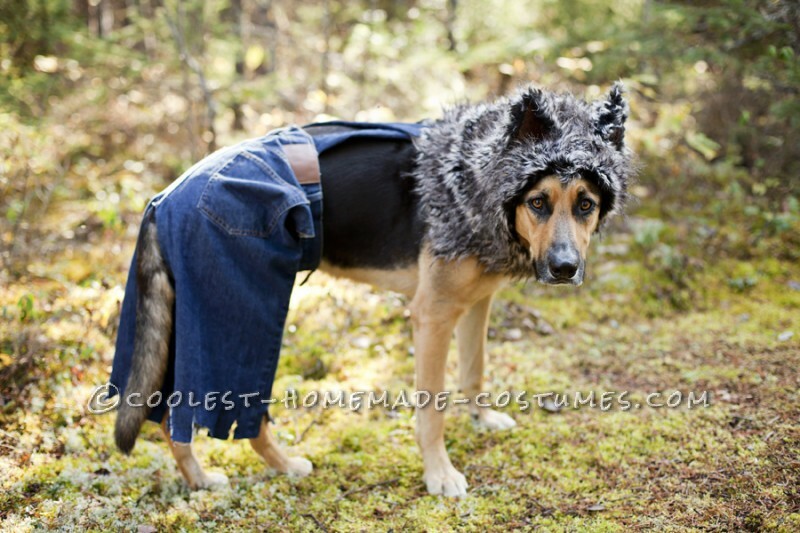 I also searched on how to make pants fit a dog but all I found was tutorials on how to make clothes for small dogs. From there I went to the thrift store to buy my material. I went to the thrift store and bought a pair of jeans. That’s all I had to buy. I used the fur from Riley’s costume from last year and I had some brown leather from a previous project. I started out cutting the pants shorter and cutting the belt area so it would fit her waist and be open for her business. Then I made a new button hole. I used the left over pant legs and made suspenders and sewed them into the waist. I tried it on her and her tail didn’t fit right so I cut a bigger opening so it wouldn’t push it down. I cut the leg buttons to look like they were torn. Then I used my daughters hooded sweater for a template for the head piece. I carefully cut out two pieces and carefully sewed them together. (Long fur is a little challenging to work with). Once fitted, I then made a neck strap and sewed in a button to secure it. I cut out leather and fur triangles for the ears and hot glued them together! her and stuffed them with scrap material. I hot glued them to the hood. The ears were always flopping forward so I hot glued the fur on the back of the ear to some of the hood fur to hold them in place. I then made two holes in the very back of the hood so that the suspenders could button on. I finished late at night and my dog was sleeping up in our bed. I went up several times to try on the hood but she wasn’t a happy camper so when the costume was done I had to wait until the next morning to try it on….I was a little anxious to see her in it, but all my hard work was worth it…..it fit! Homemade costume idea posted by Annette M.